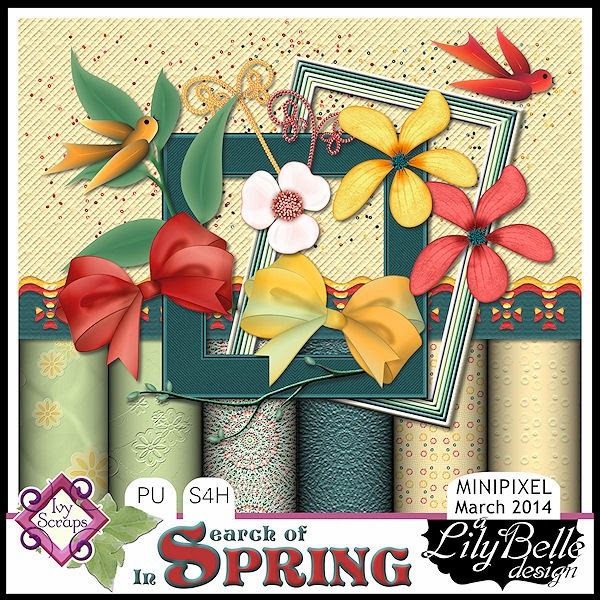 My Minipixel minikit for March IN SEARCH OF SPRING is available in the store at Ivy Scraps along with three clusters that are free with the purchase price of $1. As usual I’ve created a few “extras” – freebies for Ivy’s newsletter, Ivy’s blog and my blog. You’ll find download links or directions to download below. I hope you enjoy using this kit and freebies. These clusters are free with the purchase ($1) of the above. This quickpage in three size formats is free if you have a subscription to Ivy's Newsletter - March 1st publication. These clusters are free and can be downloaded from Ivy Scraps blog. Finally, for all the faithful readers of LilyBelle Scraps, I have these clusters.